DIY Crafty Reblog – Nail Polish Rack – It's With a "K"
This following post is actually taken from my Tumblr from a few years ago. My nail polish collection has continued to grow and can’t actually fit in this whole rack. Whoops. 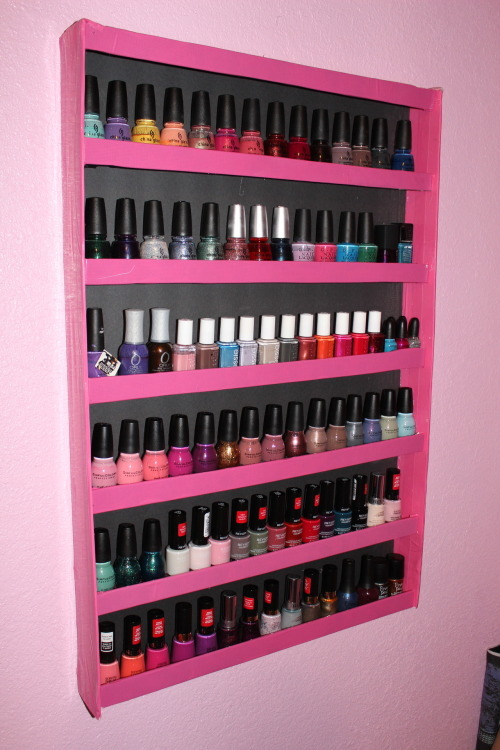 However, I still find that this is a fun, inexpensive DIY storage option for those with many nail polishes. Hope this helps you. After watching several videos on YouTube last night, I got super inspired to turn my mess of a collection into this pretty awesome rack – and it’s super inexpensive!! I personally needed just the boards (3) and duct tape (2). Lucky for me I found all of them at the dollar store half a block from my house. My cost: $0.99 x 5 = $4.95 + tax. I was a little apprehensive when I first saw a tutorial for it on YouTube. But this little bugger is sturdy as heck! I’m definitely NOT a crafty person, so I’m pleased with how this came out. Hot glue gun all the pieces together – starting with the shelves, then the sides, and lastly the shelf ends. Make sure to add a layer of glue to the bottom of each shelf for extra support.